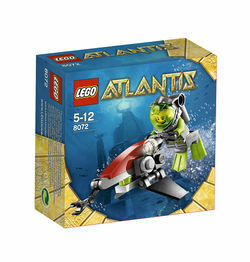 8072 Sea Jet is a LEGO Atlantis set released in December of 2009. Included is a small underwater vehicle and one Bobby Buoy minifigure. It includes twenty three pieces, seven taking up the minifigure, and sixteen taking up the vehicle. This is one of only two Atlantis impulse sets that were released in 2010. The box art features an Atlantis background. This is a description taken from LEGO.com. Please do not modify it. (visit this item's product page) Hunt for undersea treasure! Search out Atlantis treasure keys, guardian sea creatures and sunken treasure with the sleek and speedy Sea Jet! Includes deep-sea diver minifigure. Includes Sea Jet and deep-sea diver minifigure! Jet features control flaps for quick evasive tactics! The set, with spare parts off to side. Facts about "8072 Sea Jet"
This page was last edited on 9 February 2019, at 22:59.